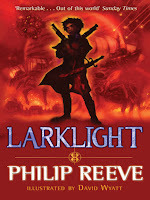 Philip Reeve is a major influence in steampunk, though his books are not as well known in the US as in his native Britain. I read and reviewed the first of his young adult steampunk trilogy, Fever Crumb, and enjoyed its unusual heroine and impressively detailed world. I always meant to go back and read more of Reeve’s work – I’d read glimmerings here and there on the interwebs of middle grade sci-fi and steampunk books. When Larklight turned up as an ebook deal a few months ago, I clicked ‘buy’ without a second thought. Then Middle Grade March came along and gave me a good reason to finish what I’d started. Larklight is a space adventure starring the many narrow escapes of the two Mumby children, Art and Myrtle. Myrtle is the eldest, and is a bit obsessed with Earth fashion. Art, the typical younger brother, is fascinated by pirates and feats of courage. They live with their father in a unique home, Larklight, which orbits the moon. Early in the narrative the Mumbys are forced to flee their house, and the resulting journey follows them to the moon, Mars, and even to the rings of Saturn. Whether they come home safely or not will be up to themselves and to the merry band of companions that they collect along the way. Reeve’s Larklight is written in the style of a Victorian-era first-hand account, and it is a triumphant tale of a boy’s travels to the far reaches of space. Art is the main narrator, though his exploits are interspersed with snatches from his sister’s private diary. The narrative is also punctuated regularly with lovely illustrations by David Byatt, which often provide a much-needed visual for some flight of imagination or curious bit of alien science. There’s not much contemplation – this is an all-action yarn filled with dramatic venture after voyage after quest. That said, the story doesn’t really hit its stride until a few chapters in, when the Mumby children encounter Jack Havock, known pirate and scallywag. Recommended for: intrepid boys (and girls!) who are on the younger side of the middle grade spectrum, along with their parents – it would make a splendid read-aloud. Will also appeal to those who long for space adventure with a touch of nostalgia, though the tech is mostly modern marvel. *shudders* The Rats of NIMH gave me a nightmare as a kid that still scares me as an adult. A Drowned Maiden's Hair and Savvy have been on my TBR list for years. And Cabinet of Wonders recently moved up on my list since a friend got me a copy as a gift. I'm embarrassed by how many books I have at home that are still unread--not enough time in the day! I'm so glad you read this one! I too read Fever Crumb, and though I didn't love it enough to continue on with the series, I was interested in Larklight largely because my library has it and I keep seeing it there on the shelf. This sounds like the fun kind of adventure I usually only read in Fantasy. I don't always mind a lack of character development if the plot is paced well enough, I may just have to pick this one up sometime.